The house where the Jarvis family lived. 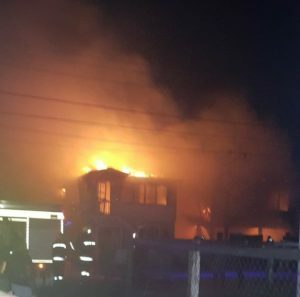 A man stabbed his wife, set their Newtown, Georgetown house on fire which spread to a nearby house, leaving the two buildings destroyed and several persons homeless. 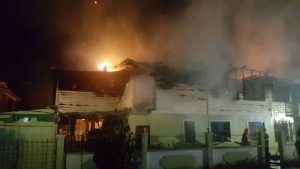 The late Tuesday night fire started at Da Silva Street, Newtown and quickly spread to the house immediately west on the corner with De Abreu Street. A preliminary estimate is that nine persons were rendered homeless. Injured is 37-year old Joan Jarvis. Sources said her husband, Osafa Kerwin Jarvis, went home and suspected her of having a relationship with another man. He then told her that all of them would die tonight, stabbed her several times and then set alight several pieces of clothing before fleeing the burning building. The woman’s injuries did not appear to be life-threatening. Their two-flat concrete house was gutted. The only person who was seen wandering at the scene was their teenage son who denied that his parents had moments earlier fought. “Only she and the man went inside the house… me ain’t know where he gone,” he told Demerara Waves Online News. The burning house where the Ordersons lived. Also left homeless are a woman, her partner and three children who occupied a two-flat wooden building at the corner of Da Silva and De Abreu Streets, Newtown for the past 22 years. 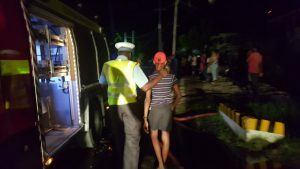 Adunni Orderson told Demerara Waves Online News that she and her family were at home at about when she heard someone screamed that there was a fire. “We just grabbed the baby and I jumped over the fence because I could not have found the keys or anything and by the time we stepped over here in two minutes time the whole place went down,” she said. A policeman speaks with a son of Joan and Kevin Orderson. Orderson’s uncle-in-law, said to be in his 70s, lived in the lower flat. She said her daughter informed that she heard her neighbour and husband were fighting and then threw something in the house, causing the fire. Her children’s ages are 22, 16 and two years. Orderson and her family plan to seek refuge at her sister who lives nearby.